Today at T3 our CEO Aaron Klein unveiled a game-changing behavioral coaching solution for advisors of all stripes. Read the full release below. • New analytics help the advisor put markets, portfolios and risk in context for clients during semi-annual client reviews. • Monthly check-ins build a strong foundation to support the advisor’s message between client reviews and give advisors an early warning signal when client psychology is deteriorating. • The constant fight by advisors to keep client psychology positive becomes remarkably easier with the consistent support of Check-ins and these powerful new analytics. Sacramento, CA – February 10, 2016 – Riskalyze, the company that has equipped thousands of advisors with the Risk Number™, today announced powerful new tools that revolutionize the ability of advisors to put the markets in context for their clients during client reviews, support client psychology between those reviews, and deliver consistent behavioral coaching that promotes long-term investing. Riskalyze CEO Aaron Klein unveiled these features at the Technology Tools for Today (T3) Conference in Fort Lauderdale, Florida this morning. Advisors have used Riskalyze for a long time to effectively set risk expectations for client portfolios, but with Client Analytics, the conversation shifts to demonstrating how well the Risk Number was able to meet those expectations and compare the outcome to the advisor’s choice of benchmark. The result is a powerful way to give the client context for why market volatility is “normal” and help clients stay the course when they may be concerned and prone to knee-jerk reactions. Advisors can leverage a powerful ally in supporting client psychology in between those reviews by enabling Check-ins, a monthly email that gathers two simple data points from each client, and proactively supports the advisor’s message with adaptive analytics that fit the context of the markets. 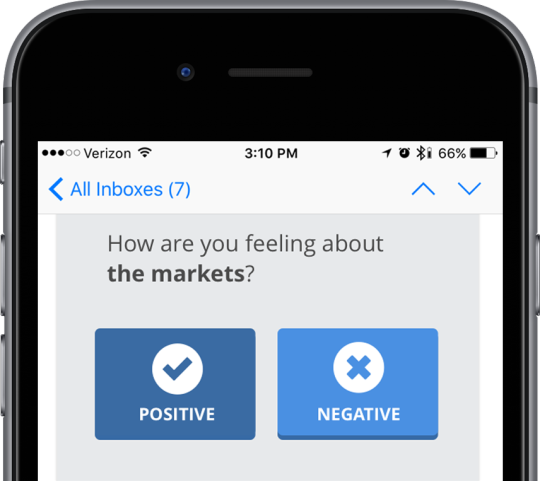 Two simple questions mark each client’s check-in — “how are you feeling about the markets?” and “how are you feeling about your financial future?” With two taps on their smartphone, clients see adaptive analytics that help them understand what is “normal” for their portfolio, and advisors get an early warning system when a client relationship needs care. Check-ins and Client Analytics will go live for every Riskalyze customer in May. Both features will be a free upgrade for existing customers on Solo, Team or Enterprise plans. For media inquiries regarding Riskalyze, please contact riskalyze@ficommpartners.com. Riskalyze is the company that invented the Risk Number™, which powers the world’s first Risk Alignment Platform, empowers advisors to execute the digital advice business model with Autopilot, and enables compliance teams to spot issues, develop real-time visibility and navigate changing fiduciary rules with Compliance Cloud. Advisors, broker-dealers, RIAs, asset managers, custodians and clearing firms today manage $121 billion on Riskalyze’s platform in pursuit of its mission to align the world’s investments with each investor’s Risk Number. To learn more, visit www.riskalyze.com.